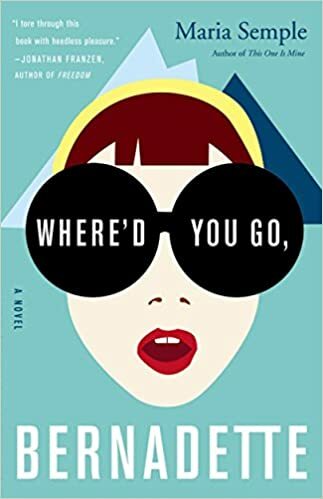 I chose Where’d You Go, Bernadette by Maria Semple to fill the spot of ‘A book everyone has already read’ because, well, I thought that everyone had already read it. It was ALL over all the blogs and best-seller lists… yet when I told my friends and co-workers what I was reading, they had NO idea what this book was. They had never even heard of it. None of them!! So I guess that only internet people have read this- so good for you guys. I LOVED this book! It’s told through emails and letters and actually, let me put up the description from Amazon: Bernadette Fox is notorious. To her Microsoft-guru husband, she’s a fearlessly opinionated partner; to fellow private-school mothers in Seattle, she’s a disgrace; to design mavens, she’s a revolutionary architect, and to 15-year-old Bee, she is a best friend and, simply, Mom. I started reading this book TWO DAYS before a co-worker was going on a cruise to Antarctica (crazy timing, right?) and I knew that the premise was that a lady goes missing sometime around her cruise… I was wanting to finish it ASAP so I could compare the cruise in the book to the cruise that she took in real life! I definitely recommend this book- especially if you want a light and fun book. This would be perfect for reading poolside while wearing a big floppy hat and sunglasses.